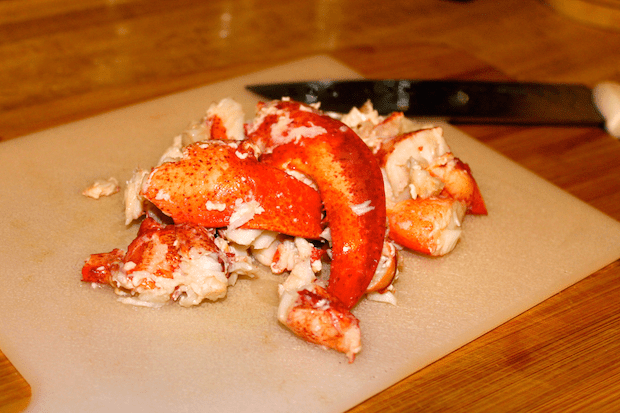 So you snagged a couple of delicious lobsters and had a wonderful meal? How ’bout another? 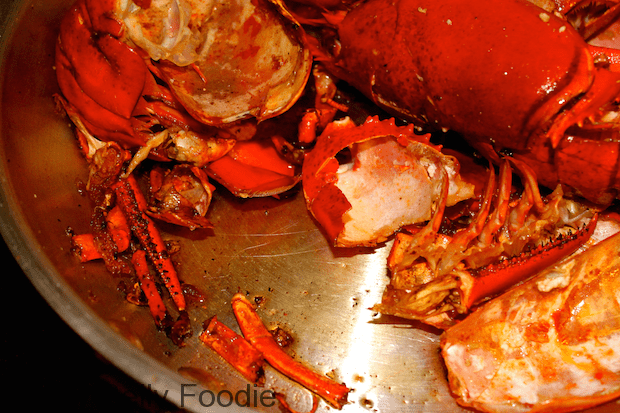 You didn’t throw those lobster shells away, now did ya? Good, because we’re gonna make something amazing with them! 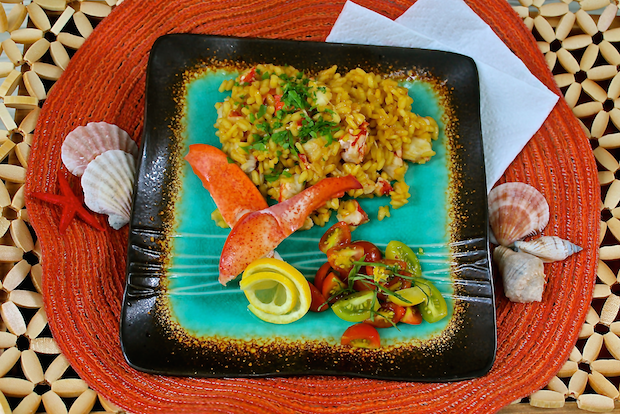 Stock and Lobster Risotto! 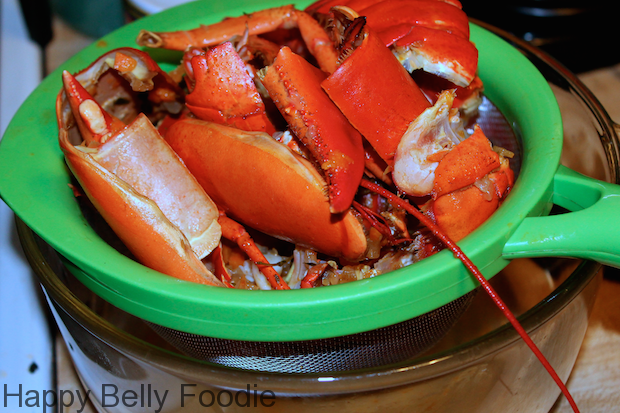 You can keep your lobster shells in the freezer until you’re ready to make your dish and they’ll keep for a few months. Alright foodies, first thing’s first. 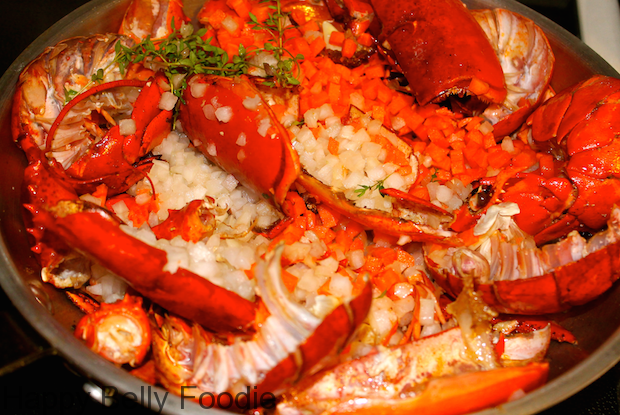 If you want a beautiful lobster risotto, you need a beautiful stock. That’s the perfect reason for saving your shells. Now some might accuse me of being a hoarder but I’m telling you, a stock made from scratch beats anything you can buy on the shelves and that’s the facts friends. To get started, we’ll need those wonderful shells. Have a nice big skillet heated over medium heat. Drizzle in some olive oil and add a little butter. Toss in the shells and toast them till their nice and bright red. Btw, this was 3 lobsters worth of shells. Get some nice brown bits going on in the bottom of the pan. Toss in some diced onion, carrots and fresh thyme. After the veggies are soft, deglaze with a splash of brandy. 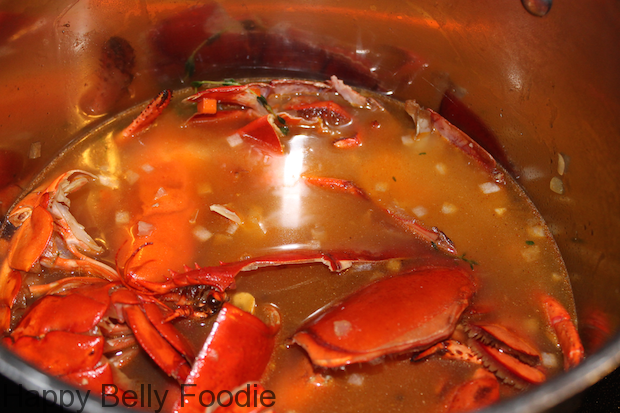 Move all that goodness from the skillet to a stock pot and pour in eight cups of fresh cold water. Simmer that for about two hours. Don’t let it come to a boil. Just let the mixture bubble a teeny tiny bit. This is a stock and you never boil a stock. Remove the veggies and any other solids from the pot as well. 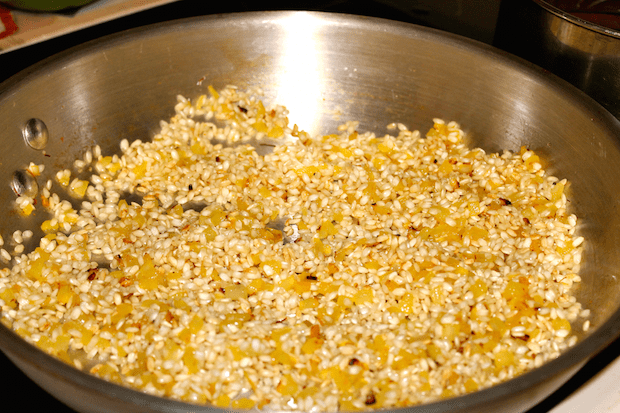 Strain the liquid through a cheese cloth to make sure any bits remaining are removed. 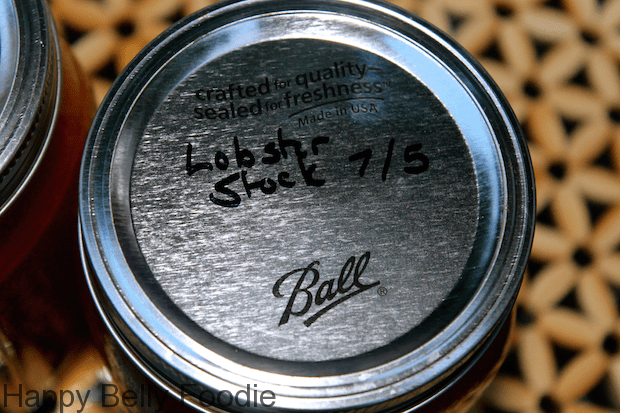 Ladle your new lobster stock (YUMMY) into some clean mason jars. Wha-LA!! 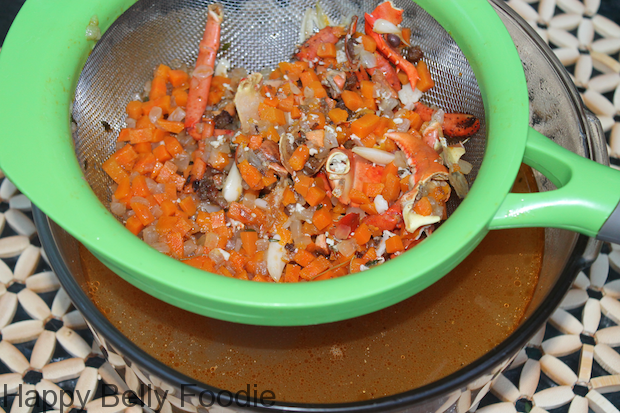 Lobster stock, all ready for some delicious meals. I came away with six cups of stock, total. Make sure you label your jars so you know what you’ve put in your fridge (or freezer if you’re not gonna use it right away). 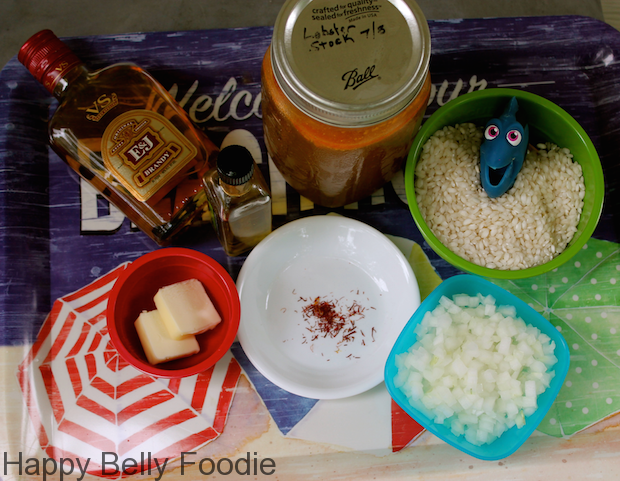 Starting with the brandy and going clockwise, we’ve got 3 cups of the stock, 1 1/2 cups of risotto (Sorry Dory, you gotta get outta the bowl unless you wanna be fish soup), a cup of onion, a pinch of saffron threads, butter and some nice olive oil. 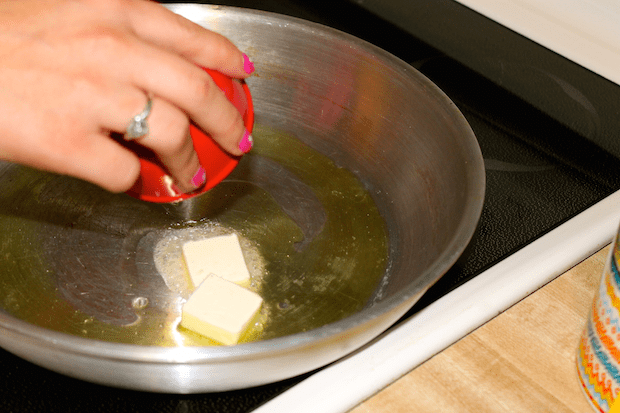 Heat your skillet up, once again and get that oil and butter in there. Once the oil and butter are good n hot, add the onions. 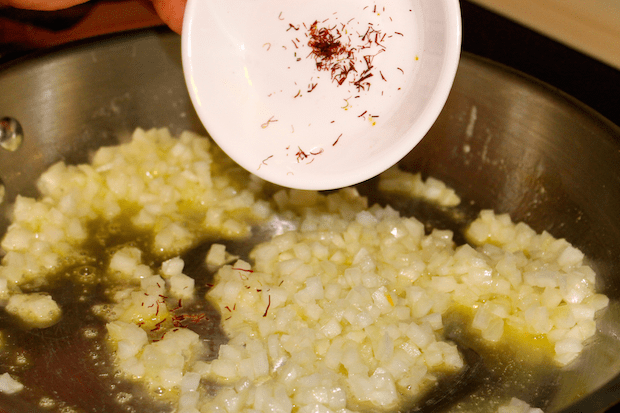 Add the saffron and cook until the onion is soft. Add the risotto. 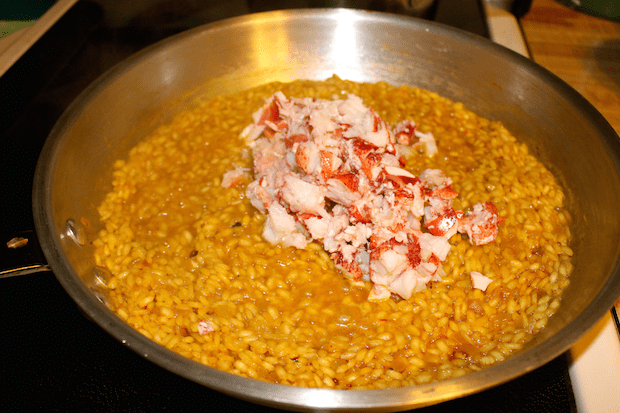 Place the lobster stock in a sauce pan and warm it through while the risotto is cooking. You don’t want to add the stock to the pan if it’s cold. It’ll stop the cooking if you do. 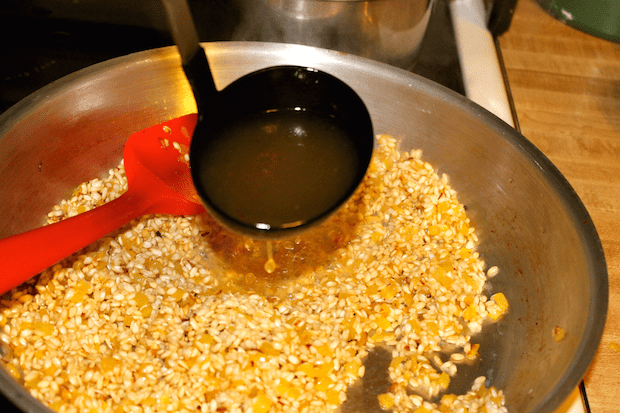 Once the risotto is nice and toasted..
Ladle in about a cup of the stock. Turn the heat down to med/low and let the liquid absorb, stirring occasionally. After it absorbs, add another cup of stock. 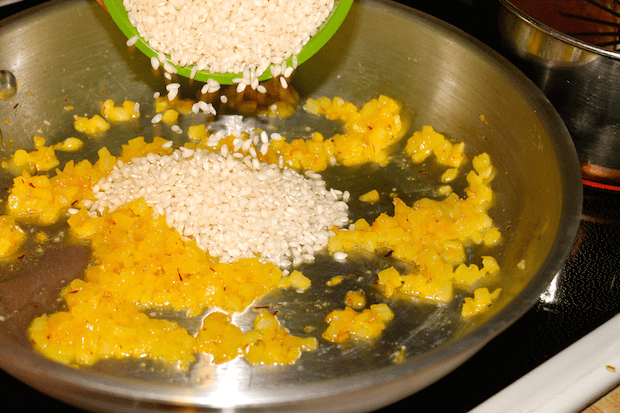 Let that absorb and repeat until all your stock is absorbed into the risotto. It’ll look like this…. Man, I wish you could smell it, too. Add the meat to the risotto. There you go folks. A scrum-dilly-umptious meal that you never knew you could have by saving your scraps. 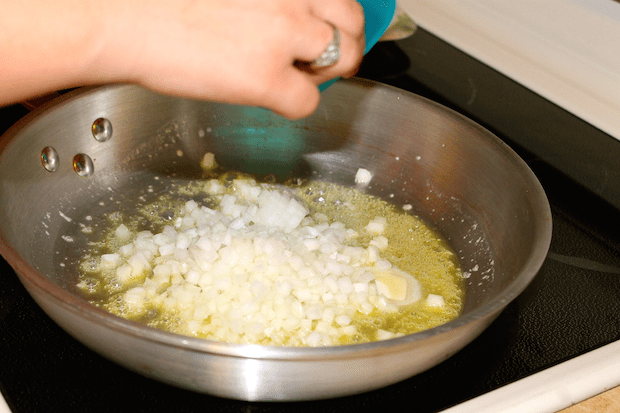 In a large skillet, heat the oil and butter over med/hi. 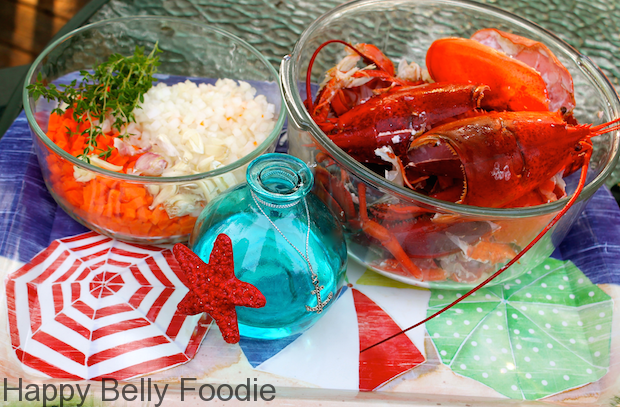 Toss in the lobster shells and cook until bright red. Add the veggies and thyme. Toss in the salt and cook until the veggies are soft. 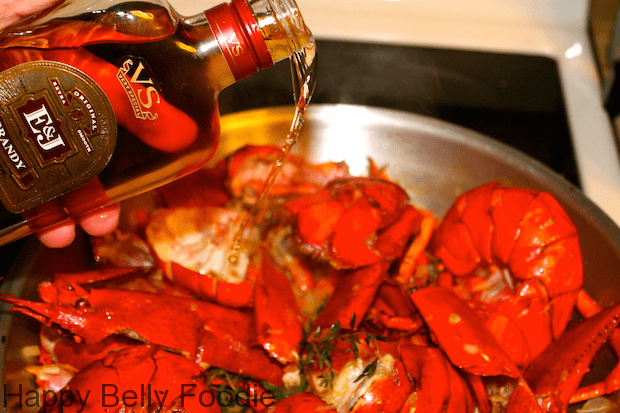 Deglaze the skillet with the tablespoon of brandy. Put the shells and veggie mixture into a large stock pot. 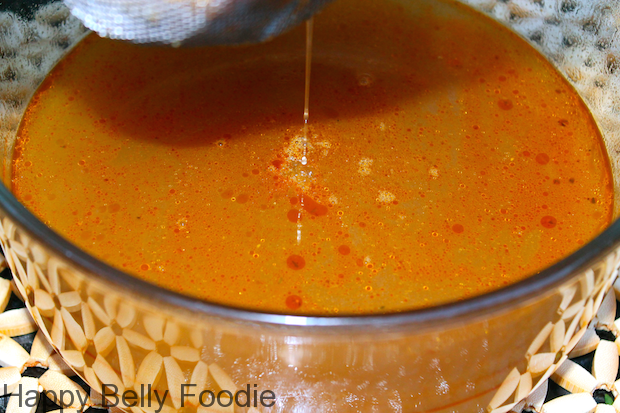 Add the water and simmer without boiling over low for two hours. Strain the liquid and pitch the solids and shells in the garbage. 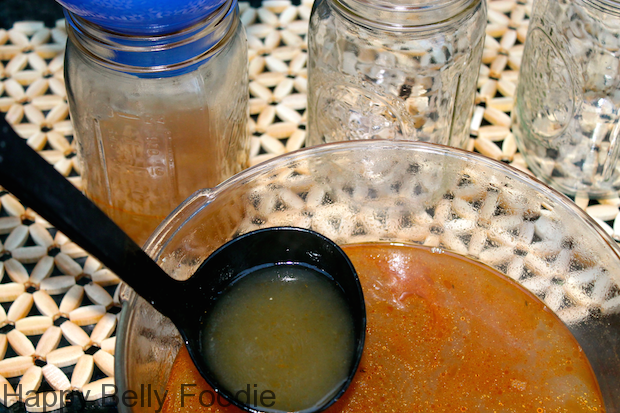 Ladle the stock into jars and label. Store in the fridge for up to 5 days or freeze. Heat a large skillet over med/hi. 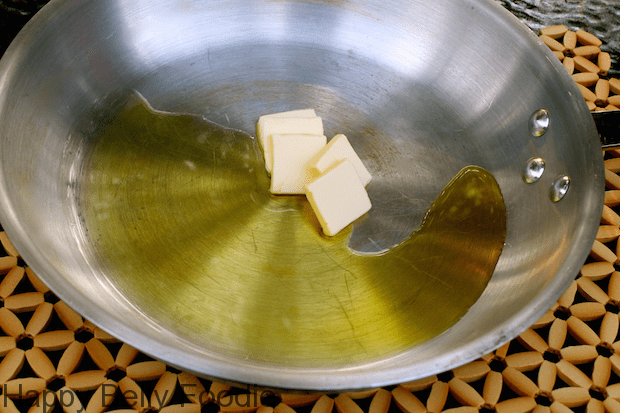 Add the oil and butter to the pan and get it hot. Add the saffron threads. Cook until the onions are soft. 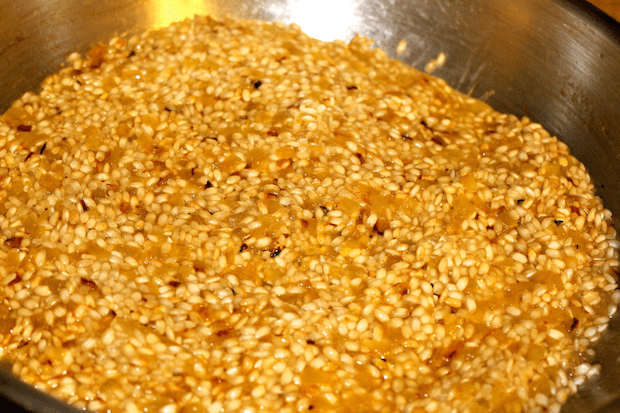 Add the risotto to the pan and toast until aromatic. Deglaze the pan with the brandy. 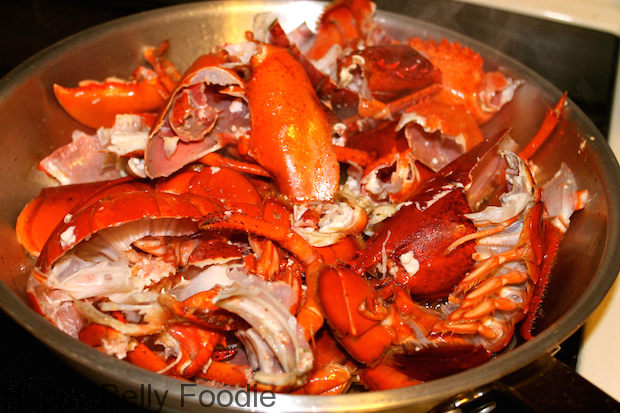 Add the lobster meat and heat through. 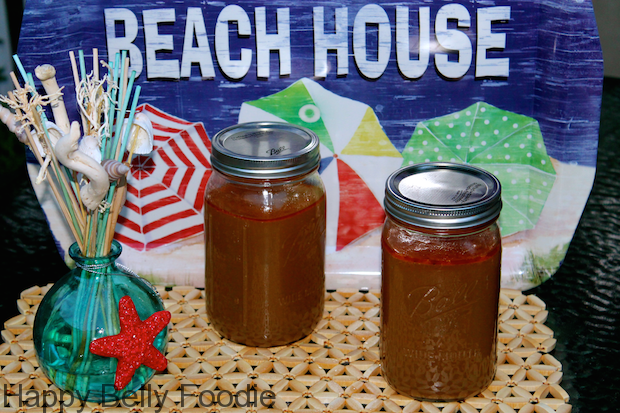 Fish Stock ~ Getting the most out of your fresh catch!